Processing chickens — otherwise known as butchering chickens — at home means putting healthier birds on the dinner table. We’ve culled our flock a number of times now, and butchering our own chickens has gone from “oh my goodness, can we do this? ?” to just another chore in our efforts to eat better food. 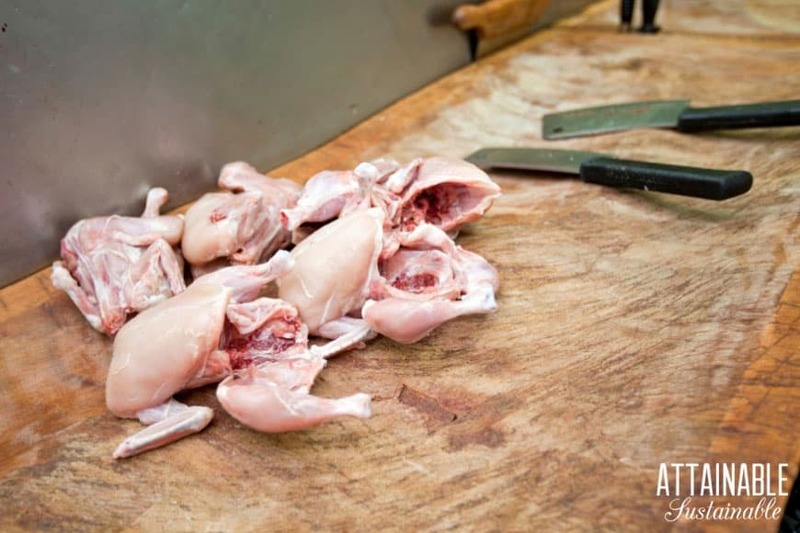 Of course butchering chickens is never an easy chore, but we do our best to tackle it in a respectful manner, dispatching each bird with care as quickly as possible. Start with just a few birds your first time. Once you’ve done it though, doing any less than five birds doesn’t really make sense. The gear is already set up; might as well make it worthwhile. If you have a friend who can walk you through the process the first time, it’s really helpful. If not, the next best thing is to search YouTube. Sharp knife, sharp knife, sharp knife. When processing chickens, a sharp knife is invaluable, both for the kill and for eviscerating. That said, next time we butcher we’ve decided that we’ll probably use a hatchet for the kill rather than a knife. If you’re plucking by hand, dip the birds into a large pot of water that’s at about 160 degrees Fahrenheit. (A simple thermometer like this is handy.) Make sure you have a tool to hold the entire bird under the water. It will try to float, and and the feathered area that isn’t submerged will be hard to pluck. Be sure to have freezer paper on hand! I don’t keep large plastic freezer bags on hand (if we have them, we’ll use them, and…no need) so this was an important one for me to remember. 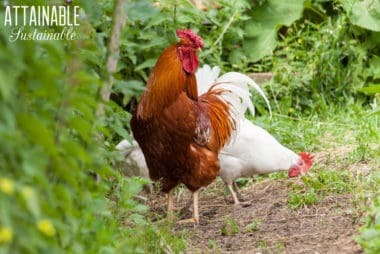 Awhile back, I asked for some advice over on the Attainable Sustainable Facebook page from those who’ve butchered their own chickens. 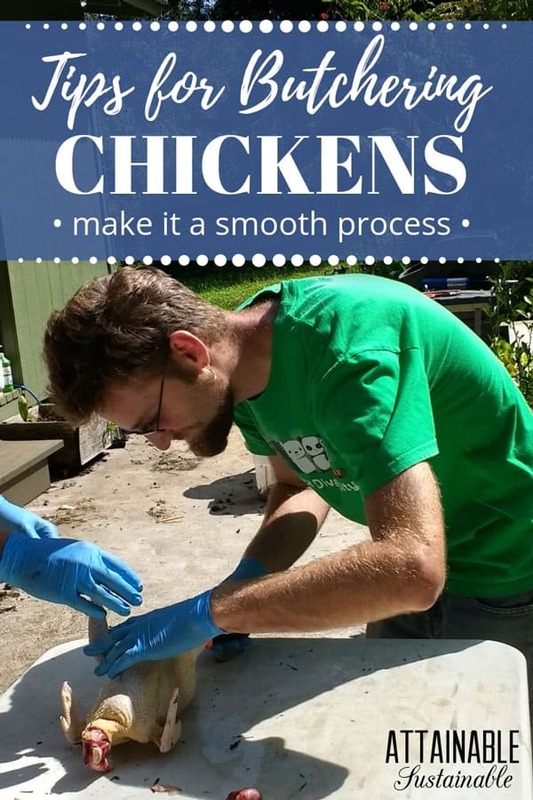 There were so many good tips about processing chickens, it seemed selfish to keep them to myself. So here, in no particular order, are some thoughts from folks who have successfully processed their own chickens. 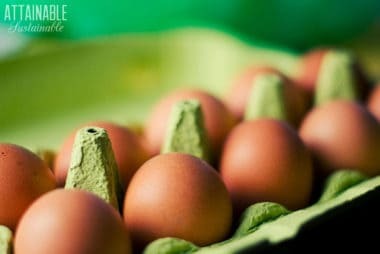 If even one of these offers an “aha!” moment for you, maybe it will make processing chickens a bit easier for you. Tony: When butchering chickens, I tie a small rope to each of the chicken’s feet and hang it upside down. It calms down immediately. Then I use a sharp knife to make one deep slit across the side of the neck. The blood drains quickly. I heat a pot of water to around 160-170 degrees. If it’s too hot, the skin will tear. I dunk the whole chicken in the hot water for about 30 seconds. After that, the feathers will slide right off and won’t have to be ripped out. Use a fork to get the lungs out. They are the hardest part of the chicken to remove. Amanda: We skin the chickens rather than pluck, much faster. Have a good system in place before you start & do a dry run first. You’ll usually see what you forgot! Sandy: I like to wrap mine tightly in a towel and hold them until they are really calm. I think it is an incredibly important thing to do yourself. 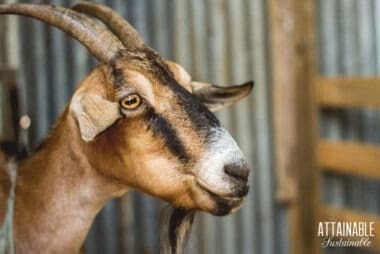 It gives you a real connection to your food and the sacrifice the animal is giving. Tom: I use the cone and do it fast with a sharp knife, humanely and with reverence and respect. Carolyn: If you don’t want to spend money on a metal cone, I’ve seen some use an old [modified] milk jug. Cone will hold them tight and secure tho and keep them calmer. 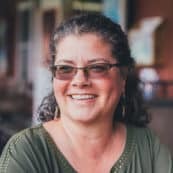 Bess: When processing chickens, don’t apologize to the bird; thank them instead. Meredith: I think most importantly, don’t stress and don’t panic when butchering chickens. It’s important to stay calm to do the job correctly and to keep the chicken calm before the deed is done. Be grateful and respectful; this animal is giving its life so that you can eat, end that life in the most respectful way possible. We always hold the bird until they’re calm and say thank you for your food. Know that you gave the animal the best life and death possible, and most of the chickens at the grocery store haven’t had it so good. Logistically, watch all the youtube videos on it that you can before you start, they’ll make you more comfortable and knowledgeable. If at all possible, find someone who knows what they’re doing and can show you the ropes of processing chickens. Have everything you need set up before you even bring the bird over, including pre-heated water for scalding. We always do it outside, it’s a smelly process. We use a cone and a sharp knife, being upside down calms the bird and this way cuts off blood supply to the brain immediately, making it a quick and less traumatic death. It’s not easy to end a life, and it shouldn’t be, but it’s necessary if you want to eat meat and want to be sure it was raised in the best way possible. Lori: Have everything ready outside. The first one is the hardest. We said we would not do it again. That was six months ago. We are now looking for the best meat hens to raise. Can’t stand store bought chicken now. Heather: When there is fear involved in the death of an animal, one can taste the adrenalin in the meat so keep your butchering away from the live animals. Sarah: I’m a [vegetarian] so could never do this, but just a sensible word of advice – don’t ever bury dead chickens on your property. You’ll invite predators. If you are not going to eat them or feed them to your animals, take them to the edge of your village for disposal. Sue: I mainly raise ducks and the plucking is easier if you put a splash of dish washing liquid in the hot water before dunking the birds. Marion: 140 degree water is better than hotter, it gets the feathers off, but doesn’t cook the skin. Easier on us too. Have large coolers with running water to cool them off immediately after gutting. John: My family had a chicken farm, so we butchered chickens – lots of chickens. The best and most humane way we found: Once you grab them, turn them upside down. Not only do they calm down, but they get faint after awhile. Tie the feet together, and hang them from a post. Since they are groggy at this point, the killing is not too traumatic for them (or you) — slit their throat, making the cut up and down, not across the throat. Dawn: Make sure your hatchet is sharp and your cone is secure. Double check your area and tools before you start. Rebecca: It does take a while to get used to it, and good at it. Joshua: Boil the water for plucking beforehand and don’t kill too many at once. You don’t want it too take more than hour before the first bird hits the ice. I just use a large pair of kitchen shears for the initial strike. I don’t pluck my birds, I just remove the skins, feathers and all. Ann: We use the cone tool when butchering chickens and I have found that if you allow the chicken to be suspended head down for a few minutes before killing them they become much calmer and seem to be in a trance. I like to locate the butchering site far enough from the chicken housing so that the other chickens do not know what is going on. Karen: It’s not as bad as you think it’s going to be! It tastes better and there’s peace of mind knowing what has gone into your food. Our first harvest of meat chickens last week went great, with a little help from our friends. Penny: Go you your nearest feed supply store they may have a processing system you can rent for the day. We did close to 70 in four hours. Anne: Make your first chop be your last. Kate: I’m a vegan but I think its far more important for people to grow and slaughter their own meat than to buy it from someone who might. I have a lot of respect for people who are able to slaughter their own animals, but personally, I would never. I also think that a lot of people couldn’t do it, which points out part of how the factory farming system continues. Factory farming is pure evil and if stopping it means getting people to grow their own and do it themselves, I can support perpetuating that lifestyle. Want to read more about butchering chickens? Put baking soda in yourchot water. Keeps the smell of wet feathers down, and they come out easily. We have butchered many chickens in the past, but I still learned something. Never thought about using a fork to get out the lungs. I’m going to try it next time. Thanks! If you are using a plucker, and we do, the water temperature has to be within 3 degrees of 147. If it is any hotter the skin cooks and tears and if it is cooler the feathers won’t come out easily. We use an instant thermometer to monitor the water temperature. We also use two pots of water so that we can keep one at the right temperature as putting birds through it quickly cools it off. We like to do 100 chickens at a time. It is more fun if you have a frolic and invite friends over to help you. Good advice on having two pots of water. And the extra hands! Lots of great information and tips! I haven’t done the deed yet but my fiancé grew up butchering and plans on getting meat chickens in the spring along with my layers. One comment. Chickens don’t have diaphragms like we do which means when you hang them upside down, all their organs crush their lungs. They calm down because they’re suffocating and most likely on the verge of unconsciousness. Not that that would be entirely bad considering what’s about to happen! But still good to know. It’s not as bad as you think it’s going to be. I am a total city-girl. Everyone who knows me can’t believe I participate in the chicken ‘processing’ at our place. If you can handle washing and preparing a raw, whole chicken from Kroger (bleh!) – you can kill your own meat. Just a little more feathers involved. I learn to butcher chicken when I was only ten years old, this I can tell you, DO NOT CUT The THROAT. It brings more pain and suffering to the chicken. On the side of their head just below of what my mother calls it ears, clean off the feathers on that area that is where the large artery is and make a nice clean cut with a very sharp knife. But before you make the cut of course secure the chicken, you can hang it upside down or how i do it is tie the feet together and the wings together.I hold the wing and the head together,with the cleaned part exposed, it takes good practice to do it this way,after i did the slicing,i put the knife down and grab the feet and hold the chicken upside down until all the blood drains, i take that moment to say a little prayer of thank you (Optional). I have never processed a chicken,when younger we would pluck the feathers,but I never seen the deed done,dad did that part,but he always chopped the head off,is that not a better way to do it than slit the throat and let them bleed out and then die?i am new to chicken raising and want to get meat birds,but only after I can do the processing part..
Teamwork! Knowing how to do even just a portion of the process puts you ahead of the curve! We get buffalo gnats real bad here. They make a swarm of hungry mosquitoes look like a fun day at the park. We tried slitting the chickens throats and since they don’t die very fast and bleed out, the blood attracted the gnats even worse and the poor things not only were hanging upside down slowly dying, but they were shaking their heads as those damn gnats were crawling up their nostrils to the point they were completely blocking the nostrils, covering their eyes. It was horrible. We found cutting their heads off in on fast motion did best. it was over with faster and they didn’t have t fight the gnats as they were dying. We do our plucking by hand. Fastest way we’ve found to do it is to take a long piece of heavy wire, like what they use on hay bales, and secure it overhead with the two sides hanging down equally. After scalding your chicken, you can quickly wrap the wires around the chicken’s legs and it frees up both hands for plucking. We put a large metal tub underneath to catch the feathers. My husband can pluck one in under 3 minutes this way. Also, I made my own metal kill cone for free out of some scrap metal I had lying around. I used a jigsaw with a metal cutting blade and a bleach jug to judge the size. I turned all the sharp edges under with pliers and hammered them flat and used nails to poke holes where I needed the screws to go through to attach it to a wooden frame which can be hung on the side of my barn. Wow, great idea for plucking! Thanks. Thanks so much for this post. My husband and I just this evening butcherd our first chicken. An extra rooster that was going to be killed by our main rooster. So it had to be done. But we plan on having meat kings in the spring so this was great first step. Your post was a great reference. I adore having tips from people who have done it! Will anyone tell me what is the best age to butcher your meat chickens? You saved the best comment for last. IMHO Kate is one very smart woman. She has her ethics right. But thankyou for the whole article. We will be doing this next summer ( Australia ). We started 1 month ago. My husband put a bar behind their head and give it a fast pull. Then I put some boil water and pluck the feathers. I put the meat in a slow cooker for 10+ hours! My family love it and at least the chicken is handle with respect until the end. BTW we are both active duty Air Force and when I tell people they look at us like we are crazy!